Which Coen Film Character Are You? 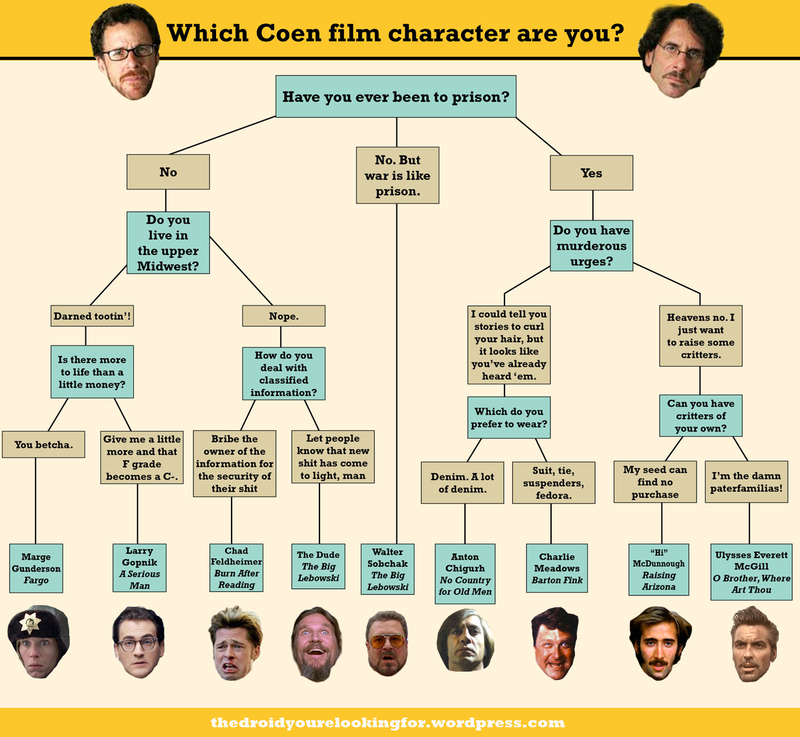 Which Coen film character would you be? Are you Marge Gunderson, cool under pressure? The Dude, abiding away your days? A serious Larry Gopnik? Let this flowchart decide it for you. Be sure to click on the image to get the full resolution version. I was discriminated against by my residence! Darn upper midwest…. It almost seems worth changing your TDYLF commenter name. The classified answer information on that one would’ve been: “I am the walrus?”. Or perhaps “Classified information takes me out of my element”. I’m the Dude. Guess I better watch the Big Labowski to see what that means…I’m getting a sense here that it isn’t too flattering. Wait… you’ve never seen Lebowski?!?! Being The Dude is the best possible scenario in all parts of life- whether it’s this flowchart or anything else. Well, there you go then. I’m the Dude. I should try to rent that this weekend. Definitely. Or better yet, just buy a copy and watch it multiple times. Uh oh, was the appendectomy a rouse to conceive? He’s a good man. And thorough. Ha ha. It wasn’t a rouse, unfortunately. Very clever, heyzeus… I should’ve expected that one. He is healing up well. Thanks, John. Which would explain why he was checking Duder’s sperm count for a crack on the jaw. I wonder if anyone has or will answer it that way. I now know why I always held Raising Arizona in such high esteem–I was Hi McDunnough. It was also the first Coen Brothers movie I ever saw and I’ve probably seen it 100 times. FINALLY, someone who will confess to their legal misgivings. I salute you, Guy Who Met Kevin Meany.